CCTV Camera Pros research and development team has recently been working on testing and documenting how to integrate burglar alarm devices with video surveillance systems using network IP cameras, CCTV DVRs, and mobile apps. You can find another post about digital IO tests here. Today, I finished building a pretty useful alarm IO test panel so that our sales and support team can easily run integrating testing of burglar alarm and surveillance system devices. 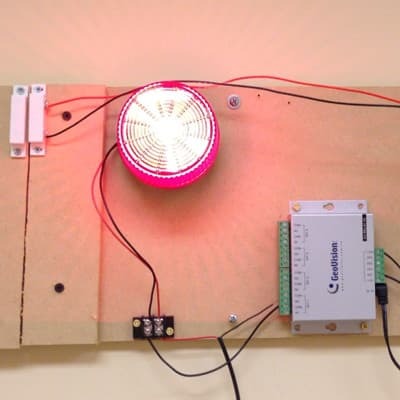 Right now the test panel is setup to be connect an IP camera or surveillance DVR to a door sensor, GV-Relay, and strobe light. I also integrated the digital output of Zavio IP cameras with our iCamViewer mobile app for iPhone so that a user can remotely turn the alarm output of the camera on and off. The app will be discussed more later. Please see a picture of the alarm panel below. Please click here or on the image to view full size. Here is how the alarm test panel works. A magnetic door sensor is connected to the digital input of the IP camera. 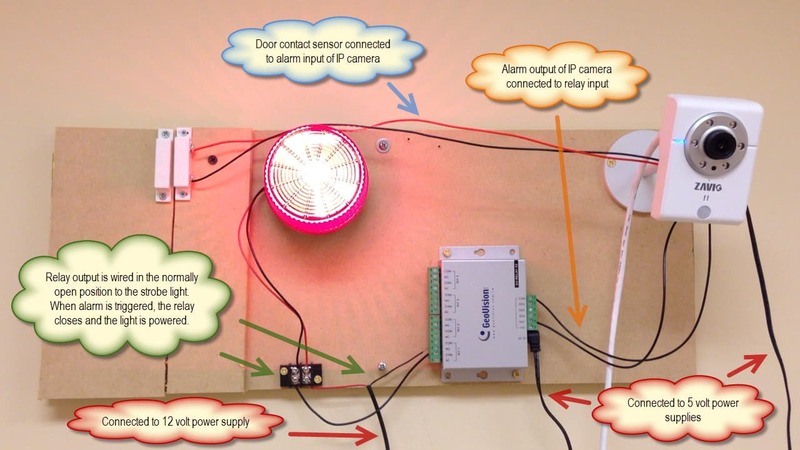 When the door is opened, the sensor sends a signal to the IP camera which triggers an alarm. The alarm of the IP camera is configured to send a signal to the camera’s digital output. This is one of many types of actions that can be taken by Zavio IP cameras with IO ports. Zavio IP cameras can also be configured to record video, take a snapshot, call an external URL, move a PTZ camera, and FTP upload an image upon alarm activation. The digital output of the IP camera is connected to the input of a Geovision GV-Relay V2. The output of the GV-Relay is connected in-line with the power supply and input of a strobe light. The output of the relay is wired in the normally open position (NO) which means that in the normal / non-alarm position power does not pass through it. When the alarm input of the relay is triggered, the relay output switches to the closed position, which allows power to run through it and into the strobe light. This turns the strobe light on. Here are a few additional notes. The IP camera, GV-Relay switch, and strobe light all use their own power supplies. The digital output of the IP camera is 5 volts which is why we need a relay in between the camera and the light. The camera does not output enough power to turn the strobe light on. When an alarm is triggered by the IP camera, it sends a 5 volt signal out to the relay. A Zavio F3110 is currently being used on our test alarm panel, however we can switch that camera out for any Zavio camera model that has alarm input / output port(s). CCTV Camera Pros offers a full line of bullet, box, dome, and cube style cameras with alarm in / out ports. Please visit this page to see all Zavio IP camera models with alarm in/out ports. Although we have not yet released the update that is required to use this feature, you can see a screenshot below of the latest version of the iCamViewer. The iCamViewer is a free iPhone app developed by CCTV Camera Pros which enables users to view IP cameras live from remotely over the Internet. The latest version of the mobile app will have the ability to trigger the digital output on Zavio IP cameras. The controls on the bottom of the screen with the on and off light bulb turn the output of the camera on and off. So, in this case when I enable the output, out strobe light turns on. 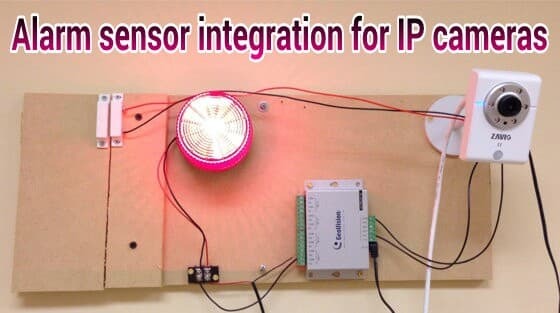 The alarm test panel pictured in this article is also used at CCTV Camera Pros to test alarm component integration with video surveillance DVRs. Because most CCTV DVRs have built-in alarm relays, the GV-relay is not needed when interfacing DVRs with alarm output devices. Here is a diagram that shows how we wired the same strobe light to a Viewtron surveillance DVR. Click here to learn more about connecting alarm devices to a surveillance DVR. What is the Best IP Camera to use as a Baby Monitor Cam?